First off, congratulations and all that to the Lakers. They're the one L.A. pro sports team that can be counted on to bring home a championship trophy every now and then. Congratulations also to Los Angeles for taking the Lakers title mostly in stride. And for embracing what looks to be a budding and well deserved tradition. I was one of those who shuddered when I heard that the Lakers parade would start at L.A. Live, the retail food court attached to Staples Center -- then head south down Figueroa Street. Figueroa isn't awful. But neither is it very inspiring, or a showcase for the city, or very densely populated on a Wednesday morning. There is that beautiful church. Nice L.A. landmarks like the Automobile Club and Felix Chevrolet. And the University of Southern California, of course. Fine institutions, but there's nothing about Figueroa that shouts out parade route. It's why even USC used to hold its homecoming parades on Wilshire Boulevard, the grander thoroughfare that for years was the go-to place for big celebrations. But the route used this week ended up being inspired after all -- because it ended at the Los Angeles Coliseum. The real party Wednesday was inside the great old stadium, built before the 1932 Olympics and the host of two memorable Summer Games. They even lit the flame for the Lakers. I remember past parades where several thousand people would line Broadway then try to squeeze into the sad little park outside the south entrance of City Hall. So I was blown away when every available seat in the Coliseum was taken – we're talking something like 80,000 people. And they were the lucky ones who began lining up early in the morning. 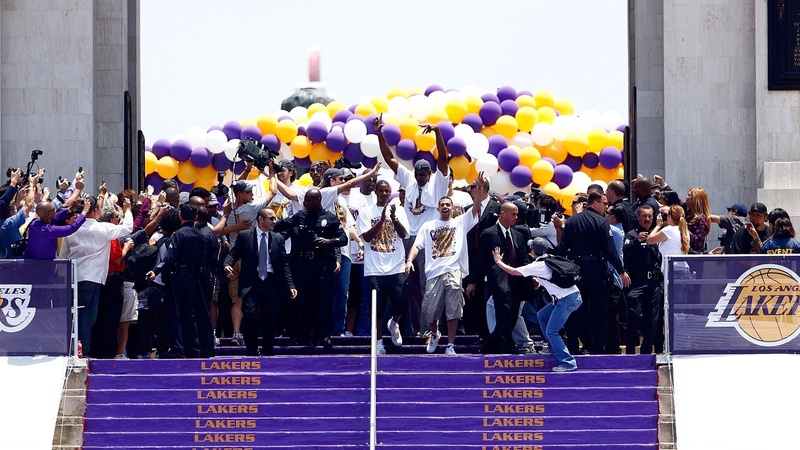 Many thousands more got stranded outside when the event was declared full, two hours before Kobe and Pau and the rest of the team arrived waving from the top of double-decker tourist buses. The heroes of the day strolled up and through the famous peristyle, and across the Coliseum floor to the actual basketball court from Staples Center, set up on the turf. The scene was almost giddy. Some called it moving to see so many Los Angeles cultures and ages that seldom have cause to mix, having a party together. For many, I suspect it was their first time inside the Coliseum. So they got the thrill of walking through those historic tunnels and encountering a smiling sea of their fellow Angelenos. Except for a few knuckleheads, as LAPD chief Bratton calls them, there really was no downside. Just some extra traffic, a bit of inconvenience. Even the few hours of wilding that occurred in the Staples Center neighborhood after the Lakers won on Sunday night faded from the headlines. So OK, I get it now. There's no way the old downtown celebrations measure up. There's no place downtown where the public wants to gather like that – and don't say L.A. Live. Downtown, let's face it, isn't the center of much except transit lines and government offices. It's not near where most people work or live or play. Moving the rally to the Coliseum is a smart step toward making these kinds of civic celebrations truly come-one, come-all. Now all that remains to be seen is whether any other teams can fill the roomy confines of the Coliseum. I don't remember any Dodgers celebrations commanding those kinds of crowds – but it could just be that it's been so long the details are hazy. As for the Clippers, and the Kings, and the Galaxy, we may never know. If the need ever arises, maybe the Coliseum's landlords can open up the old Sports Arena next door.